Israel’s U.N. envoy says any pre-election pledges regarding annexation will wait until Israel studies Trump’s deal of the century. Israeli envoy to the United Nations Danny Danon said Wednesday that Prime Minister Benjamin Netanyahu is unlikely to make any move towards fulfilling his campaign promise to annex areas of Judea and Samaria before studying the upcoming American peace proposal. Jason Greenblatt, President Trump’s point man on formulating the so-called “Deal of the Century,” confirmed this week that the finished plan is set to be unveiled in June. The date takes into consideration that Israeli coalition deal-making could last as long as six weeks and that the Muslim month-long fast of Ramadan ends on June 4. Three days before the elections, Netanyahu publicly pledged to apply sovereignty over all Jewish villages and towns in Judea and Samaria. He also specified that he would not differentiate between the large settlement blocs, which the vast majority of Israelis believe should be kept by Israel in any peace agreement, and the “isolated points” that are not necessarily within the consensus. He unreservedly backed the prime minister’s stated promise to study the plan presented by an administration that is considered the most pro-Israel one in history. “We will see the plan. We will engage and I don’t know where it will lead us,” Danon said, adding that he hoped the Palestinians will back down from their oft-stated rejection of the deal, whose details have been kept from both sides. Australia has opened a small arms and diplomacy mission in Jerusalem, months after Prime Minister Scott Morrison declared that “West Jerusalem” is Israel’s capital and vowed to move Camberra’s embassy there. Until the Palestinians change their culture of hate, “talk of land for peace is a recipe for more tragedy,” says Itamar Marcus of Palestinian Media Watch. Itamar Marcus, founder and director of Palestinian Media Watch, told JNS in an exclusive interview that the Palestinian Authority “will definitely reject” the upcoming U.S. backed peace plan, and that past Palestinian behavior does not lend support to any chance of compromise. The plan offered by former Israeli Prime Minister Ehud Olmert was, according to PLO chief negotiator Saeb Erekat, extremely generous by offering P.A. leader Mahmoud Abbas 100 percent of the land area he demanded, the division of Jerusalem and the acceptance into Israel of 150,000 “refugees,” yet Abbas rejected it. The Trump plan is bound to offer the Palestinians much less, so rejection is certain. PMW monitors and reports on the activities and statements of the Palestinian leadership daily. It continues to warn about the P.A.’s ongoing hate and terror incitement, especially in the education of Palestinian youth, and the P.A.’s continued denial of Israel’s right to exist and anticipation of its destruction. “The root of the conflict is not merely territorial. A poll by ADL in 2014 found that Palestinians ‘showed the highest levels of anti-Semitism in the world,’ and PMW was not at all surprised by this finding. The anti-Semitism taught through official P.A. structures promote the worst hatred imaginable, including the message that the Jews are the fundamental evil force in the world and therefore need to be eliminated for the benefit of all humanity,” said Marcus. “I show them that the fundamental P.A. ideology regarding Israel is not that different from Hamas, including denying Israel’s right to exist, rewarding terrorists and naming schools and sporting events after murderers. However, the P.A. leaders’ policy of duplicity has been very successful, and much of the international community thinks they are peace-promoting,” continued Marcus. 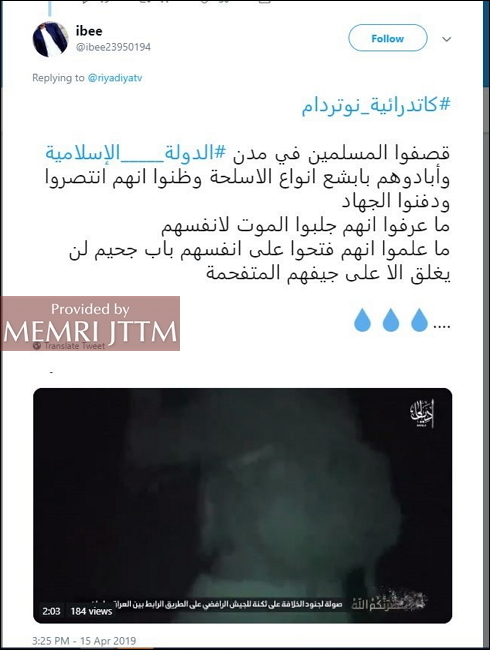 Not only the Israeli government, but many governments and legislators around the world, including Trump’s advisers, receive regular updates from PMW, and some of them tweet PMW findings to their followers. Asked if Netanyahu and Trump are likely aware of the probable Palestinian rejection of the upcoming proposal and are planning to move forward with Netanyahu’s campaign promise of extending sovereignty to Judea and Samaria, Marcus replied that if this occurred, he predicts that Palestinian opposition would not be that explosive, despite likely attempts to incite violence by Abbas. Abbas and his official PA media tried to incite violence when the United States moved its embassy to Jerusalem, but it didn’t succeed, said Marcus. The proposal to extend Israeli law to Israeli cities in Judea and Samaria “won’t change daily life on the ground, and for most Palestinians will just be a technical issue that they read about,” he argued. On the other hand, if such a move could lead to more business cooperation between Israelis and Palestinians in Judea and Samaria, it would benefit everyone, he predicted. Such cooperation is already strong and growing, according to Marcus, who notes that these projects don’t get the publicity they deserve. Trump är rentvådd – acceptera det! 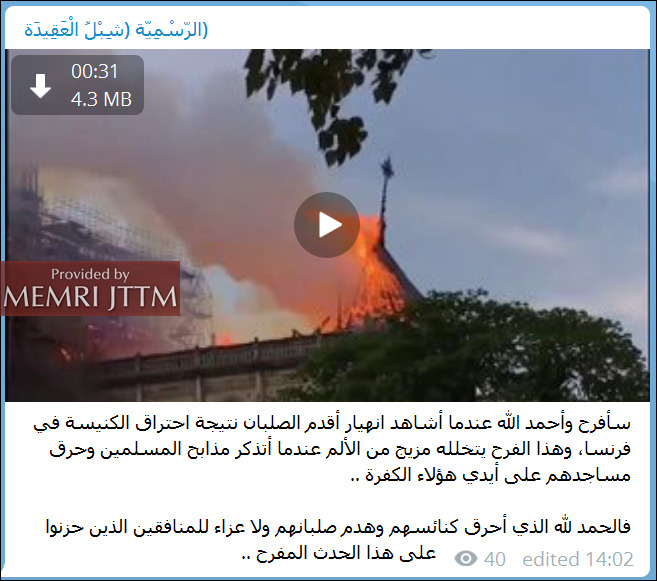 The following report is now a complimentary offering from MEMRI’s Jihad and Terrorism Threat Monitor (JTTM). For JTTM subscription information, click here. 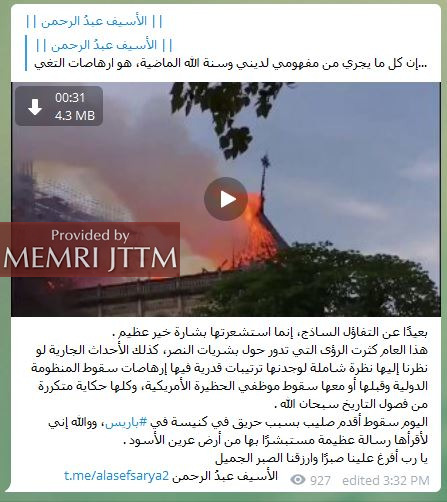 Jihadis celebrated the destruction of large parts of the Notre Dame Cathedral in Paris in a devastating fire on April 15, 2019. 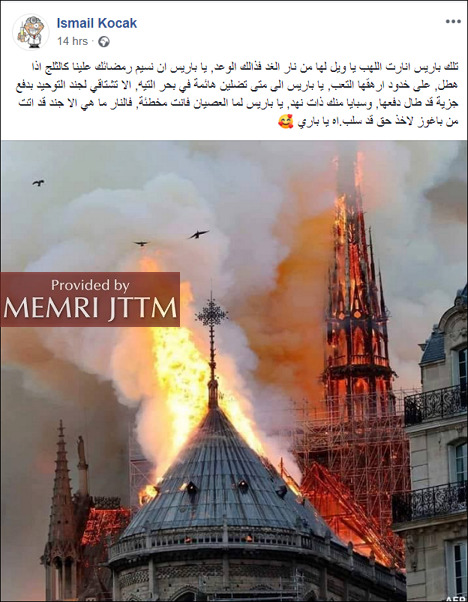 Reactions by jihadis on social media refer to the cathedral as a symbol of Christianity and a major point of origin for the Crusades. 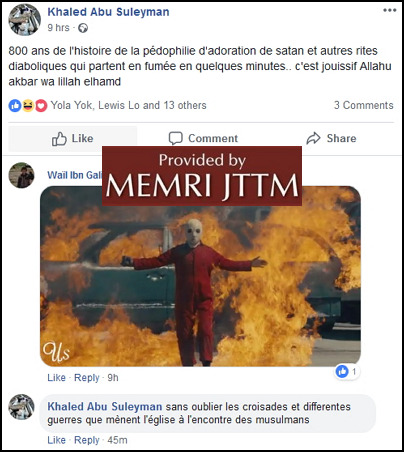 Several describe the fire as punishment for various crimes attributed to France or to Christians in general, such as France’s military intervention in Muslim countries or the mosque massacres in New Zealand. 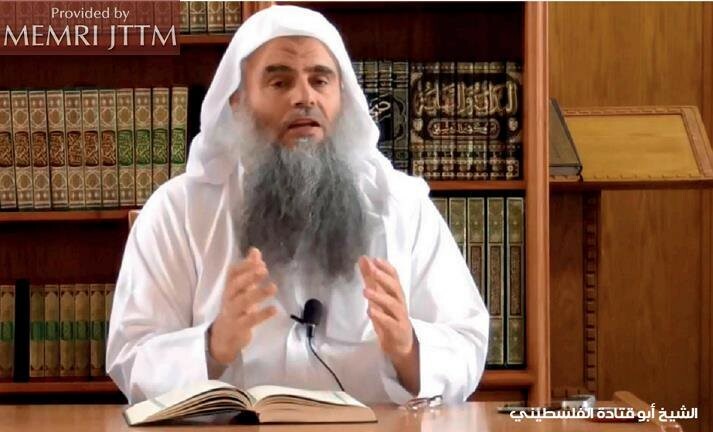 Some jihadis, including leading figures, view the incident as a good omen heralding calamities for the West and the global order. Baghouz, a village in Syria, was ISIS’s last territorial stronghold in that country until the organization was recently pushed out.